Now that we’re in 2015, I imagine many of you are looking for some healthy recipes to kick off those resolutions to drop a few pounds. I know I am! I’m working on digging up some good dishes but in the meantime, here are a few favorites that are low calorie but high in flavor. Just take it easy with some of the dressings – a little can go a long way. Blood oranges are just about to come in for the season so it’s the perfect time to try them. 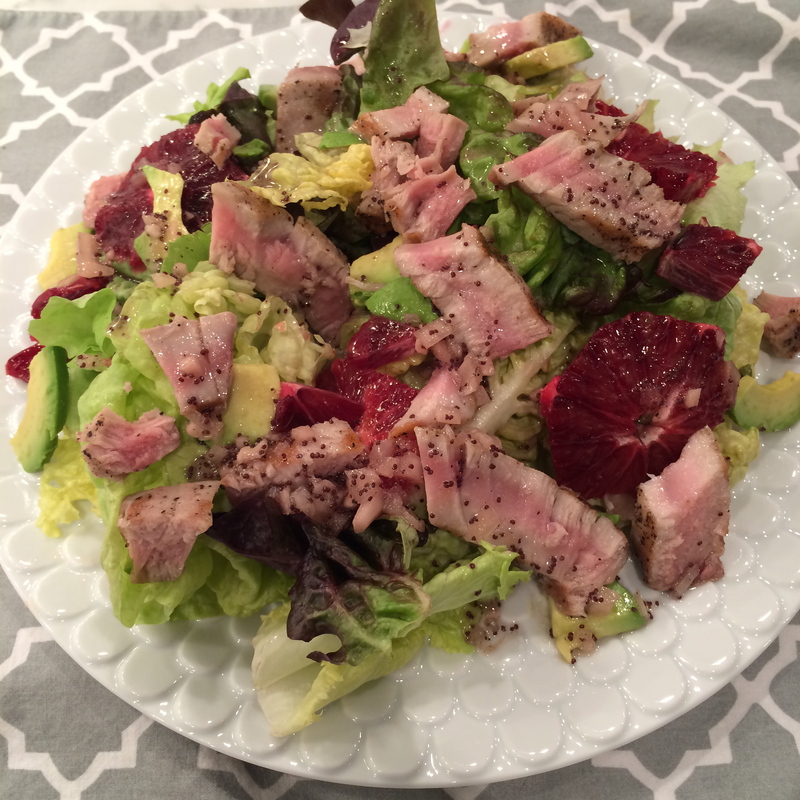 Buy some bibb lettuce, cut up some avocado and oranges and sear a little tuna with salt and pepper. Then mix in what will become your favorite dressing ever – poppyseed vinaigrette. The dressing is from Chef Alex Hitz, author of My Beverly Hills Kitchen, and it is PHENOMENAL. When you make it, it’ll last you the whole season. I store it in a very large mason jar and it usually lasts me upwards of three months. It’s also delicious served with grapefruit, manchego and macadamia nuts, which is his original recipe. If you don’t know about Skinnytaste, take a peek. It’s a great website for low-fat recipes and very helpful if you’re counting calories, Weight Watchers points, or carbs. I’ve made several of the recipes and the majority tend to be pretty good (but I’ve had some bad experiences with recipes featuring lean ground turkey – I think it’s a little too gooey and dries out easily). 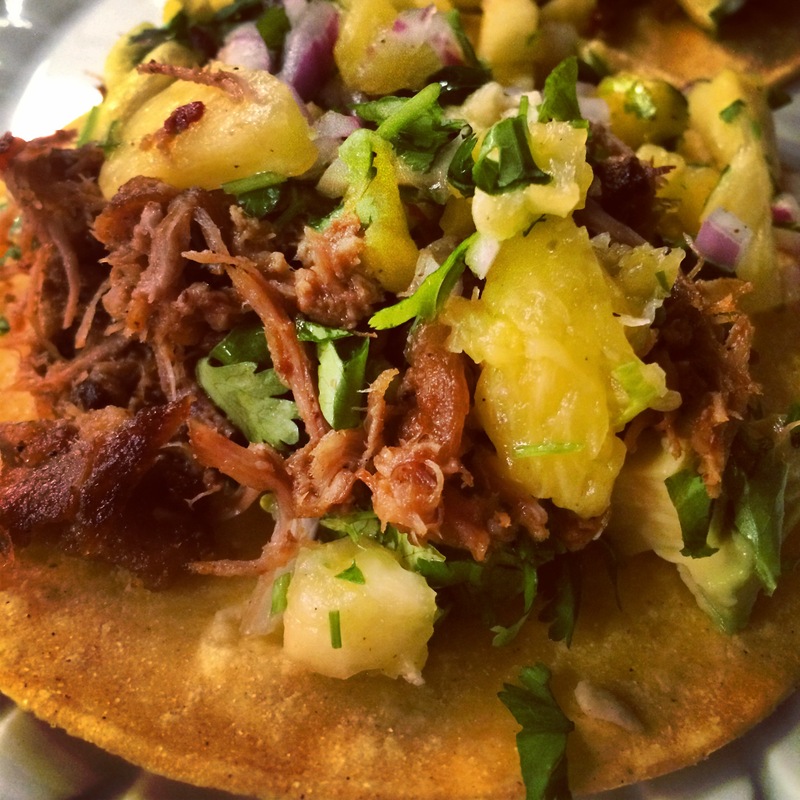 One of the best Skinnytaste recipes is the Mexican Slow Cooked Pork Carnitas. And the best part is it only takes about 10 minutes to make in the crock pot. I serve it in corn tortillas with some pineapple salsa which I make with diced pineapple, jalapeño, red onion and lime juice and sprinkle it with fresh cilantro. 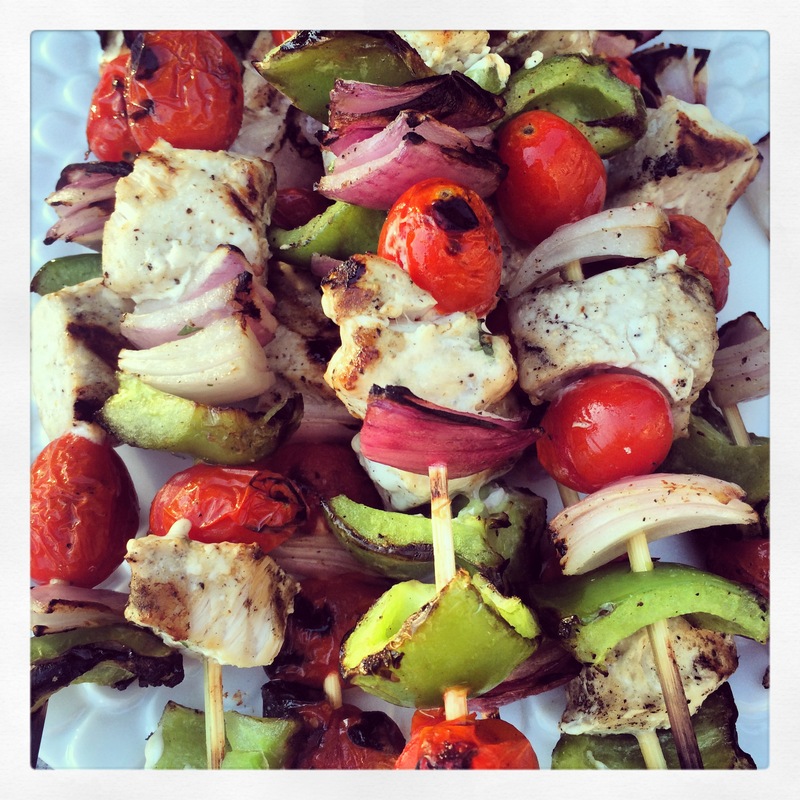 Cut one swordfish steak into 1″ pieces and skewer with peppers, onions and grape tomatoes. Season liberally with salt and pepper and lightly coat with olive oil. Grill on high heat until seared, about 3-5 minutes per side. Mix 2 tbsp. Grey Poupon mustard, 4 tbsp. fresh-squeezed lemon juice and 6 tbsp. rich olive oil (I like Primo or California Olive Ranch. The sauce should be opaque and thick when mixed. Drizzle sauce over swordfish while still warm and sprinkle with fresh chopped cilantro.